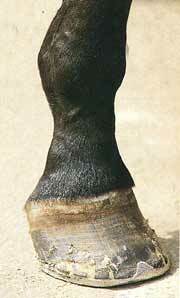 Ringbone is the name given to swelling that occurs in the pastern region of the horse's leg when bony deposits develop and build up in this area. Homeopathyhas helped a number of cases of ringbone - but successful homeopathic treatment depends on starting the therapy before the bone growth gets too marked. The condition of ringbone produces variable symptoms ranging from just swelling without lameness to serious unsoundness in a horse or pony. The symptoms depend on where the ringbone occurs and how it interferes with the horse's joint function. Ringbone is classified as articular ringbone or non-articular ringbone, depending on whether the the pastern and coffin joints are involved. It is also defined as high or low ringbone depending on which joint (pastern or coffin) is surrounded by the bony changes. Ringbone in horses and ponies is thought to be caused by trauma to the pastern and may be associated with an upright pastern conformation. It tends to occur more frequently in older horses and most usually affects the forelegs. A popular homeopathic treatment for ringbone is a combination of Calc fluor, Symphytum and Hecia Lava - these 3 remedies are believed to work synergistically to settle the inflammatory process that is encouraging the bony change. These equine homeopathic remedies are also believed to assist calcium mobilisation to shrink and stabilize the lesion - given over long periods this can be a great benefit. The symptoms of lameness can be treated as for arthritis in horses - but the best advice is to avoid mixing too many other homeopathic medicines. Acupuncture can be used to give pain relief to your horse or pony - laser acupuncture can work better than needles and treatments are needed less frequently.